The truth is that Cappadocia is a special place, surprising and unique in the world. 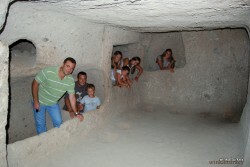 One of the places I was most impressed by the Ciudad underground of Kaymakli. The idea was to Cappadocia until then was based on the images we sell everyone about this region, the ballooning, the famous rock formations known as fairy chimneys,… So my surprise was great when I visited one of the underground cities in the area, Kaymakli. In the Cappadocia region there 36 underground cities, even though it could be more than 100 undiscovered. 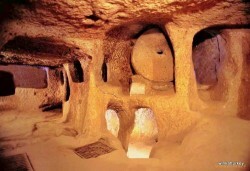 A 19 km de Nevsehir y a 9 km of the underground city of Derinkuyu. 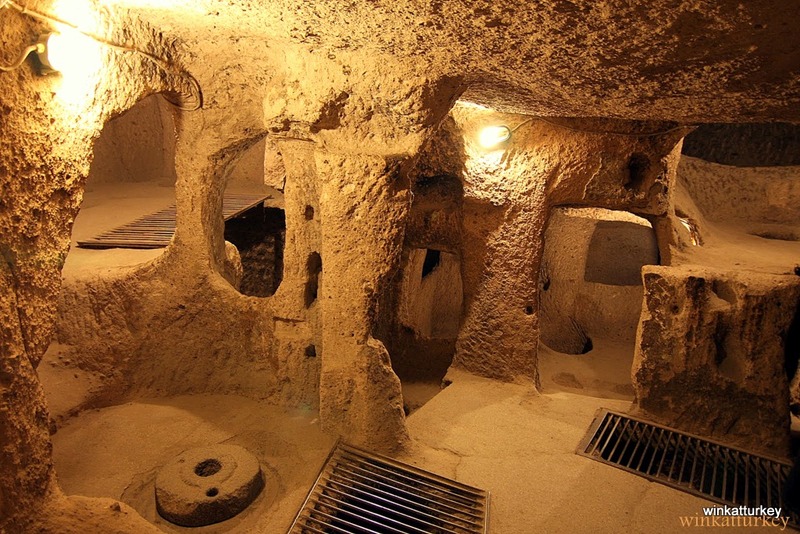 On the road to Nigde Nevsehir is this mysterious city underground. Naked and open to the public 1964. The exact date of its foundation is unknown, although it is known that the original name of the city was Enegüp. It appears that the city existed in the V century BC. It is believed that the 3 first floors were probably carved by the Hittites and after them, Assyrians, Lycians, Persians, quimerios were settled in the city. Before Christianity was the official religion, the first Christians suffered much persecution and took refuge in these cities. They used these complexes as well as shelter place of worship. Apparently the city has a disorganized and chaotic path, but the fact is that it is not. 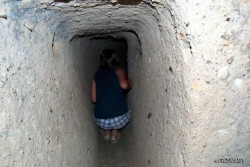 The resort has several superimposed floors, exactly 8 underground levels narrow passages formed by inclined. They organized around ventilation shafts. 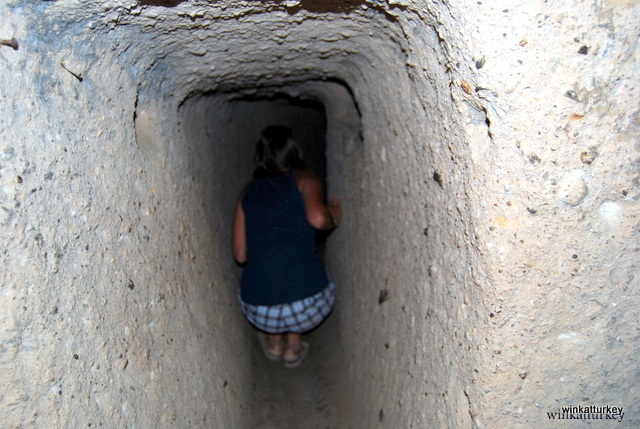 The truth is that the top can be a bit claustrophobic, in fact my husband would not go because he bowed down to being trapped in a line of people in a narrow passageway or think you could be missing air. It took a while to convince him to enter, get a guide who spoke Spanish around the entrance and the truth is that it took in an area where not many people and explained, and made fully understand the layout of the city. Eventually all, even my husband delighted with the visit. The inhabitants of the city were perfectly formed, the first floors were used as stables for pets. On the second floor we can see room, a cemetery, wineries, water tanks, kitchens where you can see the roofs of soot impregnated. We will see even a church. All arranged in a maze of tunnels and warehouses escaleras.En third inter alia. Very strange shaped stone mill wheel used for grinding wheat. The city reached a significant size where hundreds of people could live even 6 months. The vent can be seen from the first floor, this is a vertical shaft passing through all floors. In case of attack they could block access from one plant to another by means of an ingenious locking system. 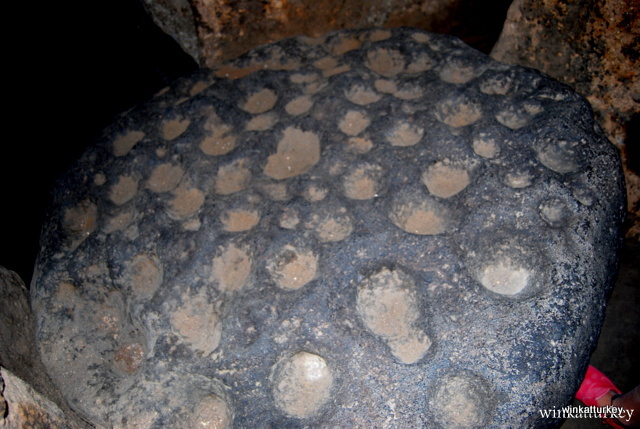 A huge disc-shaped stones, embedded in a hole in the wall were displaced to block the entrances to the passages. Could only be moved from the inside. Really amazing and very interesting to visit.